How to administer effective discipline without hurting your child. While it may be the least enjoyable part of parenting and educating, discipline and consequences are fundamental. A child who is not disciplined and never admonished will not only be less motivated to strive for more, but may actually sink from the level that he has already achieved. But the art of discipline is tricky. When done incorrectly it can leave lasting damaging effects. Criticizing a child the wrong way can hurt his self-esteem in the long run. These 10 guidelines are designed to foster healthy discipline and consequences. When it comes to our own personal shortcomings we easily overlook or make excuses for our deficits, saying, “Nobody’s perfect!” Children are entitled to the same consideration. We need to temper our immediate reactions to their misbehavior with the knowledge that they’re not finished products. Keeping this in mind helps us be more forgiving and tailors our response to a more tempered and productive one. We may be tempted to notice every wrongdoing of a child, perhaps to show them that we are on top of a situation. This can be a big mistake. Some behaviors can and should be overlooked. If a child did something that was totally circumstantial and you are not concerned it will be repeated, the best thing is usually to just keep quiet. You should work on noticing three times as much good in your child than bad. The more good you notice and comment on, the more the child will strive to earn that positive attention from you. Children deserve to be given the benefit of the doubt just like adults. Before you scold a child, show him that you take him seriously and ask him what happened. Really listen to what he has to say. You may not want to accept every excuse or fabrication which he will offer, but it is invaluable to show a child that you are not judging him until you hear him out. You’d be surprised how many times you may actually be mistaken about his behavior, or at least about his intentions. Even when you feel sure that you must rebuke or even give a consequence, start your message with something positive. Tell your child that you understand that he probably didn’t really intend to do anything wrong, or that you understand that he may have been provoked into doing it. The fact that you demonstrate empathy and understanding preserves his dignity without justifying the behavior in any way. As much as your child may resent being scolded or punished, he will at least feel that you listened to him and don’t think any less of him. No matter what the situation is, never tell your child that he is bad or that you are very upset with him. Talk about the behavior, talk about the situation, talk about what happened, but don’t make it personal. Let your child know unequivocally that you believe in him. Tell him that it is because he is so special and has so many fine qualities that such behavior was inappropriate. When you label a child, that label may stick in his heart forever. You may intend to motivate him to improve but you could be doing just the opposite, ultimately hurting his ego and self-esteem in the process. Don’t compare your child to anyone else. Even without saying anything negative about your child, any comparison to a sibling or classmate can be hurtful. Each child is unique. Aside from feeling that he will never match up to the one he is being compared to, it is hurtful to know that his self-worth is being determined by somebody else’s measuring stick. When you harp on the past, making your message all about what happened, your child may see it as your way of getting back at him for an inappropriate action or behavior. To succeed in discipline, steer your message toward the future, so that it will come across as a message of love and concern. Be clear that you are looking ahead and are confident that your child will do better in the future. The more your mindset is future-focused, the more positive, hopeful, confident, and optimistic you will come across. Don’t imply that you feel the future will be more of the same, as you may be setting yourself and your child up for exactly that. When reprimanding or implementing a consequence, make sure that the “what and why” is extremely clear to the child. Before taking this step, ask yourself if the scolding and the consequence are necessary and appropriate for this circumstance. Was the child warned? Was the child aware? Will the child understand it, or will he assume it to be cruel and unfair punishment? When you feel comfortable with what you are about to do, be clear about what made you unhappy, and what you expect changed in the future. Be specific and on both the nature of the wrongdoing as well as your expectations. Your general attitude toward your child or student should be a loving and caring one. When there is enough love in advance, the discipline and consequence will not arouse intense negative feelings. Right after a consequence or rebuke is given, try to lift the negative energy right away by moving straight back into positive, loving mode. Don’t be afraid that by doing this the child will think you’re just kidding. If you made yourself clear, your message was heard, but now your job is to make sure that there are no residual negative feelings that can erode the relationship and trust. Without retracting from the punishment or warning in any way, win back your child with loving words and behavior. If you are unsure about whether or not to discipline, err on the side of caution. When you are worked up and angry you may not be thinking clearly. Chances are that if you wait till you are less emotionally involved, you will make a better decision. Even if you forgo the opportunity to rebuke when you should have done so, you’ll be doing less damage than if you do rebuke when you should not have. When in doubt about if you should hug a child or rebuke him, an extra hug will probably be the smarter choice. Discipline is essential for children to grow up as responsible and confident adults. Implementing these ideas will help you discipline at the right times and in the most healthy and effective way. Rabbi Shimon Gruen is the founder of Leha’ir, an organization that offers classes, workshops, teleconferences, and counseling geared to promote conflict resolution and relationship building, with a special emphasis on parents and educators. Rabbi Gruen specializes in practical tools for marriage communication, classroom management, effective teaching, and success in the workplace. His forthcoming book Never Get Into a Conflict Again, will be published in Fall 2017. According to the National Home Education Research Institute, more than 2 million American children are homeschooled. That’s a huge increase from 1980 when only about 10,000 families in the U.S. homeschooled their kids. What was once an alternative practice is becoming mainstream. Contrary to what some people believe, homeschoolers aren’t missing out. In fact, they may be exposed to a more comprehensive set of experiences and skills than children who attend traditional schools. Homeschooled students tend to score up to 30 percent higher than traditionally educated students on standardized and achievement tests. They are also just as socially and emotionally intelligent as anyone else. Perhaps this is because they’re learning things that aren’t available in the average public school. Some experts say that traditional schools are raising children to be little encyclopedias. Teachers focus on the amount of information that kids can memorize. The kids that fall short of remembering all the facts feel like they’ve failed (and may also receive lower grades). This wipes out their desire to learn. The world is constantly changing. Students need more wisdom than knowledge to keep up. If they have a desire to learn, they’ll continuously search for answers instead of striving for the highest marks or the biggest reward. The other problem with rote memorization is that it usually bypasses conceptual learning, according to The Atlantic. Reciting the 50 states in alphabetical order is impressive, but is it really helpful if students can’t identify them on a map? Memorization that comes from raw rehearsal doesn’t necessarily help children learn concepts. It simply allows them to remember information at the surface level. However, repeated use can be a beneficial form of memorization. With this process, children end up automatically memorizing information because they have repeatedly used it in practical and applicable settings. Some kids get on the bus at 6 a.m. and don’t get back home until after 4 p.m. If they have to finish up their homework and have dinner, they don’t have much time left for extracurricular activities. Flex ED argues that homeschooling allows children to focus on their interests. Many parents who homeschool say that their children complete their academic work in much less time than students who go to school outside the home. This leaves more hours for practicing athletics or hobbies. When students are immersed in doing something they’re passionate about, they’re more likely to develop a love of learning. When playing sports, kids can learn about anatomy. When drawing in a sketchbook, they can learn about shapes, color, and relativity. Giving children more time to develop their interests can lead them to become powerful explorers and free thinkers. Research shows that the decline of playtime has led to increasing reports of anxiety, depression and attention problems in children. Scientists at the Institute of Social Research say that children between the ages of 6 and 17 spend about 7.5 hours more a week on academics than they did 20 years ago. About 32.5 of those hours are spent in school. When children have the opportunity to make their own decisions and direct their own actions, they gain a sense of confidence. This self-assurance reduces their risk of developing emotional disorders. Kids also learn to develop coping mechanisms for intense emotions through play. Homeschooled children are more likely to have the time available for copious amounts of free play. Many public schools are more concerned with being politically correct than helping kids think on their feet, according to William R. Klemm Ph.D., author of Blame Game, How to Win It. Although Klemm believes that public schools don’t require children to do enough memorization, he does think that conformity is valued over individuality in educational institutions. When children are encouraged to think like everyone else, they lose their ability to form their own opinions. Although parents can also be guilty of forcing their own opinions on their kids, the less structured, more flexible environment of homeschool may foster creativity. Some research points to the fact that open classrooms inspire creativity better than traditional classrooms. Parents may be more likely to support independence than schoolteachers. The format of homeschooling lends itself to self-regulation and investigation. You don’t have to wait for everyone else in the class to be on the same page before moving forward. Many students who attend school sit through health classes that are designed to get them to recognize healthy foods and exercise regularly. Homeschooled children may be able to experience the benefits of living healthfully in person. For example, gardening with children has been shown to have benefits for the mind, body, and soul. Kids can spend an entire day in the garden and knock out a variety of essential learning. They get the physical exercise that they need. The heavy work that is performed during a gardening session, which involves pushing and pulling, is vital to helping kids develop body awareness, according to Understood. It organizes the brain and calms the body. Although schools are required to allow time for play, most young children don’t get enough exercise, says WebMD. At home, you could spend a full day outdoors doing heavy work or other types of activity as you learn about photosynthesis, the weather, plants, and animals or just about anything else. Plus, gross motor skills are linked with a boost in brain function, explains Your Therapy Source. Physical activity can especially affect cognition in elementary and middle schoolers. One study showed that both fine and gross motor skills can improve mathematical performance when they’re incorporated into learning. This is much easier to do at home than in the typical classroom setting. Many children aren’t getting the opportunity to learn fine motor skills before they start kindergarten. This Lancaster Online article explains that when children enter school without the proper fine motor development, teachers are unable to work on academics appropriately. This highlights two problems. One is the fact that toddlers and preschoolers aren’t getting the occasion to play and manipulate objects in order to build the muscles and coordination necessary for fine motor activities. The other is the fact that traditional schools expect kindergarteners to sit at their desks for long periods of time doing classic learning instead of working on their fine motor skills. In February 2015, the New York Times reported that there was a dramatic increase in the number of students who needed occupational therapy. It can be argued that schools should be incorporating this type of learning into the academic setting so that kids don’t have to be pulled out for special therapy sessions. At home, kids can practice fine motor skills in a real-life setting. Cooking is one activity that requires the use of fine motor skills. Sewing is another one. When children learn to sew, they also learn spacial awareness and patience. Psychology Today says that children with advanced fine motor skills are more likely to do better in school. This may be because the same parts of the brain are activated when processing motor information and performing intellectual tasks. When stronger connections are formed using fine motor practice, an individual will be better able to process academic data. When children move around efficiently, they’re also likely to have more diverse experiences at an early age. This results in an increased number of neuronal connections in the brain. More pathways can make for quicker processing of information and an elevated ability to rationalize, analyze and reason. Many homeschool advocates stress the fact that children don’t learn enough about life skills at school. They’re referring to financial management, communication skills, home economics and how to fix things around the house. Shop class, cooking, and sewing used to be part of a basic curriculum. Now, many students don’t even learn cursive in school. In 2011, Smithsonian questioned whether home economics classes were still relevant in today’s society. Those types of classes began in the early 1900s and taught life skills that were pertinent to modern consumer culture. They’re also starting to be pulled from schools because of a lack of funding and a rise in a technology-focused curriculum. However, knowing how to cook a healthy meal, manage a household, use power tools or sew a basic seam can get you pretty far in your daily adult life. Homeschoolers are at an advantage when it comes to learning life skills. They can spend their time shadowing their parents as they take care of everyday duties that make “adulting” easier. Just like traditional education, homeschooling isn’t always implemented effectively. However, it can give students a chance to excel in areas to which they aren’t exposed at school. I started this blog because I love to sew 🙂 ​The purpose of this website is to provide you with sewing tips, review the latest products and most importantly, build a community for us to express our love for sewing. It’s back to school time. Regardless of your child’s age, there are steps you can take to help your child thrive and flourish more this year. The key is focusing daily on these habits. Our children recognize our priorities when we don’t drop the ball despite the pressures and stress of family life. Putting homework and books into knapsacks nightly, clearing away your plate and fork from the dinner table, placing laundry in the hamper are all examples of daily tasks that teach children to be self-responsible. When you realize that the mess you make is yours to clean and that there is no one who is going to be accountable for your tasks but you, maturity is gained. Parents often give lectures about being responsible but the real way of transmitting this essential character trait is through making sure that our children live what we preach. Successful children understand that they can be self-reliant and independent. They don’t whine about their tasks. We don’t fall apart as easily if we recognize that life is about accountability and responsibility. Children who are socially happy in school and know how to settle conflicts with peers will be more successful students. If you see that your child is getting bogged down in arguments with siblings or friends, make a mental note of what is happening. Is your child overly sensitive? Is she easily explosive? Does he always have to get his way? Does your child know how to give space to others-both physical and emotional? Is shyness or lack of self-confidence preventing socialization? Social skills are not automatic. As children grow we may notice that they are being excluded. Some children are socially awkward. Others don’t know how to read social cues properly. And there are those whose parents hovered when they were little so that they are now inept in grade school, high school, even college. A 20-year study at Penn State and Duke found that kids with good social skills became more successful as years passed; it behooves us to help guide our children. Pay attention to the way your child deals with peers and family members. Instead of jumping in, allow your child to find resolution. If you must, speak privately to your child about the right way to apologize and forgive. (Some adults may need to brush up on these skills before teaching their children.) Open your child’s eyes to feeling empathy, giving a helping hand to someone in need, and being sensitive to other’s challenges. Too many of our children sit in front of their screens completely oblivious to the people around them. Facial expressions, eye contact, body language is completely ignored or misread. They do better with emoji’s than living breathing human beings. Texting all types of emotions is easy but saying “I’m sorry,” “I’m so happy to see you,” or “I’m excited” feels clumsy. The power of a kind word, reassuring gesture, and sympathetic eye cannot be minimized. Our children are losing this vital human connection through which relationships are built and endure. Teach your child to put down his phone, especially at dinner time. Be sure to lead by example. Sit down and communicate together. Share a funny story or something that happened to you during the day. Children require calm and adequate time to study. Pushing off studying until the last possible minute is a bad habit. Checking texts or Instagram while doing homework ensures a distracted mind. A loud noisy environment does not encourage concentration. If you know that your child is a procrastinator, or that assignments are consistently missed as the year passes, set a goal to tackle the issue this year. Ask your child before the problems begin: what can we do to make this year better? Involve your child in the solution. Good study habits bring children to feel more secure and self-assured as they face their school day. Parents should be careful not to put down their children’s teachers and authority figures. We must model the behavior we expect. When we speak respectfully of teachers and school rules, children understand that their behavior towards school and authority matters. We will not look away at rudeness, ignoring of tests and projects due. We have come to fear failure. Many parents would rather stay up the entire night and complete the science fair project than see their child grapple with a poor grade. Take a step back and recognize that even when not doing well there is opportunity for growth. There is no life that will not be touched by disappointment. Each person will find themselves in a situation where he has fallen and must pick himself up and try again. If never allowed the experience, how will our children know the power of their efforts? Resilience cannot be taught, it must be lived. Give your child space to grow. Pushing the idea that grades matter more than effort strips children of discovering their inner power to accomplish greatness. This year pave the road toward success by focusing daily on these four habits. Shanghai-based LeapLearner represents the first global venture built from the ground up by Chinese and Israeli cofounders. Chinese students rank best in the world in standardized tests but don’t excel in thinking out of the box. Israeli kids aren’t great test-takers but have exceptional innovation and problem-solving skills. 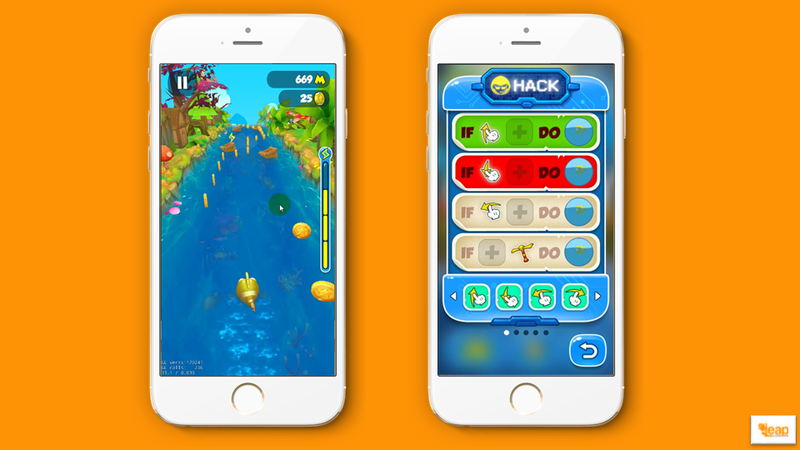 LeapLearner, the first Chinese-Israeli startup, puts those qualities together in a disruptive online and offline platform to teach kids coding along with critical 21st century skills including innovation, self-learning, problem-solving, creativity and adaptability. During the three-week self-learning program meant to be used outside of school, children as young as five are guided in examining the coding in games they play and then learn how to change variables in the code of those games. For example, in Pac-Man, children can change Pac-dots into bananas and Pac-Man could appear as a pet dog. LeapLearner helps users progress in their coding expertise from variables to natural language programming to Java Script, culminating in an in-person or online hackathon to build a video game from scratch. This gives the kids a way to get acquainted, work together, and connect with adults who can help them advance. “Whether you want to be a philosopher, doctor, lawyer, artist or banker, you must be literate in the language of the future,” says CEO Ami Dror. LeapLearner launches commercially on June 1 in Shanghai, in September in Latin America, and in early 2018 in Greater China, India and the Middle East. The multilingual platform also will be provided free to children in European refugee camps, pending a deal with a hardware partner. “Places that give strong weight to education in the family are our target market,” says Dror, noting that Chinese families invest a high percentage of their income in their children’s education. itoun Ventures, an Israeli hybrid investment firm cofounded by Dror and Forsan Hussein. Aaron Tian, a well-known Chinese math teacher, is CEO of the LeapLearner China in Shanghai. “I had the idea for a company that teaches kids soft skills, and I wanted to start with coding because the process teaches children how to innovate and problem-solve,” Dror tells ISRAEL21c from Shanghai. Dror’s close friend John Wu, formerly the CTO of Alibaba in China, loved the idea. Tian, Dror and CTO Leo Zhao not only believed they could overcome those differences but even take advantage of the best of both worlds, namely “the Israeli ability to solve problems and deal with challenges from different angles, and the Chinese way of dealing with conflicts very harmoniously and getting things done quickly,” explains Dror. Zaitoun is the major shareholder in LeapLearner but most of its $5 million in seed money comes from Chinese investors including Wu. The company has some investors in the United States and in the Arab world “who believe in the vision,” says Dror. He moved his family to Shanghai, where he is handling strategy and product design alongside the LeapLearner staff of about 50 people, many of whom do not speak English. Hussein is managing the Israeli end of the business in Haifa. Dror, a serial entrepreneur who taught himself to code as a child, is a fellow at the Aspen Institute-linked Aspen Global Leadership Network. This worldwide community of entrepreneurial leaders from business, government and the nonprofit sector share a commitment to using creativity, energy and resources to tackle societal challenges. Dror says it is the Aspen Institute GLN that infused him with the vision of making LeapLearner available for free in refugee camps and he is actively looking for ways to make this happen. In general, however, LeapLearner users will pay a “tuition” fee for the program. Every parent wants their kids to be happy. They’ll do whatever it takes to see them smile. But does that come at a cost? A psychological phenomenon known as the overjustification effect results in children who are less likely to perform well when they knew they would receive a reward at the end. In sports, participants care less about working hard and succeeding because they know they’ll get a price, regardless. Later on in life, your child may be less likely to work hard when studying, applying for schools, internships and careers because as a child, they grew up believing that hard work doesn’t make that much of a difference – the outcome will still be the same. … and competition inspires incentive. If children know they will get a reward, what is their motive for developing problem-solving skills that will put them ahead of their competition? Do you remember the dreaded field day in elementary school? The day jam-packed with activities like the mile run and the long jump? Some classmates loved field day. It was the highlight of their school year. Most of the students, however, dreaded it. While a scarce few students would give field day their all, the rest of the students did the bare minimum. Some kids took eight minutes to run the mile, others took twice as long. And at the end of the day, everyone received the same identical ribbon for participating. How did that make the hard-working students feel? Did their passion, preparation and hard work even matter? Some parents will argue that competition is not healthy for children. But competition is inevitable in schools and in the workforce, and it’s crucial that children learn how to combat it at a young age so they can be better prepared for the future. We all know that over-used quote, “life is not about the destination, it’s about the journey.” Participation prizes ignore that important (yet cliché) life lesson. Children can no longer enjoy activities they participate in (whether that’s a sporting event, arts event or something else) because they’re so focused on what they’ll get out of it. In elementary school, I was a part of my school’s annual talent show from first grade to fifth grade. The last two years, school faculty members decided to give out ribbons to every participant – and it killed the mood of the show. While no one “won” or “lost”, having a reward at the end of it all ruined the point of the show: we were no longer there to showcase our talents, we were there to be rewarded for our talents. Children are being taught that it’s OK to fail, because they’ll still receive the same reward as the winners. And yes, of course it’s OK to fail, but not because we are still all winners even when we lose. Failing at something can be a great learning opportunity for children. But with participation trophies and endless praise, what they’re learning from failure is that there’s no difference between that and success. Children today grow up not knowing how to handle rejection – an essential life skill. Established expectations also comes with a sense of entitlement. As children grow up they’ll soon realize life didn’t turn out quite the way they had hoped it would. Maybe they didn’t get into their favorite college or their dream job wasn’t actually for them. That inability to grow from rejection has made our children feel they deserve more or better than what they have. They’re asking “where’s my trophy?” Start now and allow your children to feel sad about losing. This will give them the opportunity to reflect on how to improve and handle loss in the future. If your child has ever received a participation trophy, it doesn’t mean you have failed as a parent. Take this as an opportunity to teach your child about hard work and success. Remind them that activities aren’t about winning or losing, it’s about doing your best and enjoying your time. Most importantly, let your child know that you will love them no matter how successful they are. One good deed will bring another. “One good deed will bring another good deed,” says the Mishna (Ethics of the Father, 4:2). There is so much wisdom in this statement. The more we focus on the good, the more motivated we are to do more good. This Torah idea that good brings good is actually the basis for Cognitive Behavioral Psychology, a technique used to effectively combat anxiety, depression and a variety of other mental health issues. “One good deed will bring another good deed” is also a very effective tool for correcting and reinforcing good behavior in our children. The key to raising good kids is to “look for the good” in them and in their behavior. Parents have a tendency to focus on their children’s negative behavior while overlooking the good. We can train ourselves to see good even in the little things our children do. Once we are focusing on their positive traits we can then compliment them, which will in turn nurture more positive behavior. But there is a trick. When pointing out children’s good behavior we want to be as specific as possible and focus on the actual positive behavior that we are noticing. Phrases like “great job” or “good boy” are too general and don’t work. In the long run it just makes children feel more insecure and less capable. Here are some examples of how we can use this technique to help our children improve their behavior in many different areas. Using the concept of “One good deed will bring another good deed” or “looking for the good” can be a game-changer in our parenting. It gives us a better perspective and generates a tremendous feeling of positivity. It transforms potentially ugly and harmful interactions into positive relationship building moments. And you are modeling to your children how to focus on people’s positive behavior and maintain an optimistic attitude. You can’t get more positive than that. Adina Soclof, MS. CCC-SLP, is the Director of Parent Outreach for A+ Solutions, facilitating “How to Talk so Kids will Listen and Listen so Kids will Talk” workshops as well as workshops based on “Siblings Without Rivalry.” Adina also runs ParentingSimply.com and is available for speaking engagements. You can reach her and check out her website at www.parentingsimply.com or www.thinkaplus.com. Transition between summer and school can be difficult for children – and for parents. Any change in life can bring nervousness, worry, and irritability. Children often have a hard time adjusting to new situations, unfamiliar teachers, and the more rigid schedule needed during the school year. When feeling overwhelmed, our kids may express their emotions through becoming argumentative, fighting more often with siblings, or withdrawing into themselves. And parents can find it difficult to keep calm and not lose themselves in anger when things don’t go right. Reach out to your child’s teachers before your child reaches ‘zero hour.’ Many parents feel as if teachers are their opponents and don’t realize that we are are all here to try and help our children grow in the best way possible. If you think that there may be an issue, it is a good idea to set up a meeting with the teacher and ask how you can work in harmony. Too many parents call teachers to demand and accuse instead of saying that we would like to solve this problem together. Before going to the principal with a complaint, see if you can first diffuse the situation. If there are any special concerns going on in your home, do not wait for the teacher to find out through your child’s acting up in class or failure to keep up with schoolwork and poor grades. When a grandparent falls ill, if there is a health issue, financial stress, marital upheaval, problems with siblings, or any other factor that may affect your child’s academic or social success, it would be wise to enlist your child’s teacher as your confidential ally and gain her/his understanding. You can believe that most teachers would go the extra mile and extend to your child an open heart. Set rules and follow through with consequences when needed. Set routines for meals and bedtimes that establish stability. Develop your child’s ability to put himself in the shoes of others and grow more sensitive. Help your child learn how to express frustration, disappointment and anger without hurting others or retreating into sullenness. Establish basic rules of conduct: no hitting, kicking, biting, spitting, (no hands allowed), and no hurting others through our words. When children feel as if they are gaining skills and becoming self-sufficient, they grow more confident in their abilities. You will watch their self-esteem take off. Each year, every child should be able to point with pride to a newfound skill or added responsibility that comes with age. Teaching our children to pick out their clothing, dress themselves as they grow older, tie their own shoes, pack school snacks, make lunches the night before, set their own alarm clocks instead of waking them up, and having children put away their books and organizing themselves. Allow a young child to complete puzzles and feed himself on his own and as he grows, to do his homework and projects by himself. It is much healthier to tell a child that you will check his work when he is done instead of sitting beside him and correcting the answers as he goes along. Book reports and science projects should not be parent’s homework. Have your child help around the house and gain responsibilities instead of waiting to be served. Some skills children can help with are putting away laundry, setting and clearing the table, helping to serve guests, baking, cooking and keeping their room in order. Our children should never be afraid to speak with us. No matter how tough the topic, even if they messed up badly, they should not fear that we will hate them or want to close the door on them. Our love must be unconditional. True, there may be consequences or emotions of disappointment, but they must know that we are here for them. After all, we are their parents and if they cannot believe in our love for them, whose love can they believe in? Work on communicating with your child this year. I am not just speaking about when you must call him in with a problem like failing grades or after you received a call from his teacher. I am talking about daily interactions where you share a smile, a good word, a laugh, a story, or a meal together. The main thing is that you put the time and energy in so that he knows that he matters in your life. Talk to your child every day-even if it’s just for a few minutes. Put down your iPhone , turn off your laptop when your child (or you) return home, at mealtimes and story times, and when you pick your child up from school. Look at him and make eye contact while having a conversation. Speak to your child in the tone and with the words that you wish he would use with others. Express your love every day, no matter how tough the day. I know that some days will bring unforeseen difficulties and that some children seem more challenging than others. But at least we will know in our hearts that we have tried our best to help our children navigate the road of life successfully. Slovie Jungreis Wolff is a noted teacher, author, relationships and parenting lecturer. She is the leader of Hineni Couples and daughter of Rebbetzen Esther Jungreis. Slovie is the author of the parenting handbook, Raising A Child With Soul. She gives weekly classes and has lectured throughout the U.S.,Canada, Mexico, Panama, and South Africa. A 7-point guide to the Jewish coming-of-age ceremony. Caterer? Photographer? What is the essence of a Bar/Bat Mitzvah? Here are the seven key points you need to know. First, let’s understand what the words “Bar (or Bat) Mitzvah” actually mean. The phrase translates as “son (daughter) of commandment” – i.e. the young person becomes responsible to observe the commandments (mitzvot) of the Torah. The purpose of the commandments are to keep our lives focused on what’s truly important: family, community, and a relationship with God. Although we commonly refer to “having” a Bar Mitzvah, technically speaking, this is impossible. The term “Bar Mitzvah” refers to a status, in the same way that being a student or parent is a status. On a deeper level, just as their bodies are growing and changing, so too their souls are growing and changing. Kabbalistic tradition says that a person’s spiritual being has several levels of soul. A new level of soul (called neshama) comes into awareness at Bar/Bat Mitzvah time. This is the time when moral awareness and sensitivity fully develops, enabling young people to take responsibility for their actions. One’s actions after reaching this stage of life are considered more significant for another reason: The Talmud explains that a mitzvah performed because one is commanded, is considered greater than a mitzvah performed voluntarily. This is because a person has a natural aversion to fulfilling an obligation. Overcoming this aversion is a sign of maturity, and this is what the Bar/Bat Mitzvah celebrates – reaching the stage of obligation. On Shabbat (and various other days), the Torah – a scroll containing the Five Books of Moses – is read publicly. The Torah is divided into 54 portions, following an annual cycle, with one portion read each week in the synagogue. The weekly portion is further sub-divided into seven sections. At Shabbat morning services, people are called up and honored with saying the special blessings before and after the reading of each section. The Torah is removed from the holy ark, and then carried to the bima, the raised platform from where the Torah is read. While the Torah is being carried, everyone stands out of respect. Colloquially speaking, when people say, “I had a Bar Mitzvah,” it means that they had an aliyah to the Torah in synagogue. “Aliyah” means to “go up” to the bima. The Torah scroll is meticulously written by hand by a God-fearing scribe. A number of rules ensure that the Torah is written with perfect accuracy, thus maintaining the unbroken chain of tradition back to Mount Sinai. 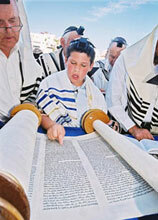 On the Shabbat following his 13th birthday, the young man is called up to the Torah. This calculation follows the Jewish calendar. At the conclusion of his final blessing, some synagogues have the custom to good-naturedly pelt the young man with candies. Following this, the bar mitzvah boy reads a portion from the biblical prophets, called the Haftorah. During a period of persecution 2,000 years ago, Jews were forbidden from reading the Torah, so they instituted a reading from the prophets that corresponds to the theme of that week’s Torah portion. The Haftorah is read with a unique traditional melody. Following services, the congregation usually joins in a Kiddush, a small lunch that begins with a blessing over wine. One popular feature of the Bar/Bat Mitzvah celebration is a reception. This should ideally be held on the day which the young man/woman becomes 13/12 years old. If necessary, the celebration may be postponed somewhat. 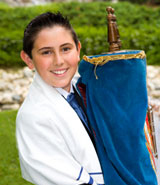 There are different practices regarding what is done at a Bar Mitzvah celebration. It is proper for the young person to relate some Torah thoughts at the celebration – i.e. the famous Bar Mitzvah speech. The speech usually contains ideas from the weekly Torah portion, and emphasizes the young person’s commitment to Jewish values. And what about that Titanic-themed party with Hollywood-style special effects? It’s important that the festivities should not become so ostentatious that the spiritual significance becomes secondary. The new adult should appreciate that this is a celebration of maturity and responsibility, a message which will carry through for the rest of their life. Now what about the ubiquitous Bar Mitzvah gift? In the old days, the gift of choice was a fountain pen, then a Walkman, and today an iPod. With that in mind, my favorite gift idea is a tzedakah (charity) box. Every Jew should have a tzedakah box in his home, so he can drop in change on a regular basis. The money can then be given to support a Jewish school or institution – in your home town or in Israel (every Jews’ “home town”). There are beautiful tzedakah boxes made of wood and silver, and you can see a selection here. • The Long Road to Freedom, by Avner Gold, an exciting historical novel filled with intrigue and insight into Jewish life. • Triumph – Aish.com’s popular book of inspiring true stories of challenge and spiritual growth. Upon reaching age 13, a boy begins the obligation to put on tefillin every day (except Shabbat and holidays). 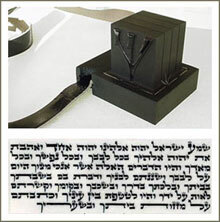 Tefillin are two square, black leather boxes, which contain parchments of Torah verses. Attached to each box are black leather straps. One of the boxes is worn on the bicep, and the other is worn on the front of the head. The two boxes represent the two ways that we serve God in this world: thought (the head) and action (the arm). The arm-tefillin contains one parchment in one compartment, whereas the head-tefillin is four parchments, each in its own separate compartment. This is to signify that in service of God, the two powers must work congruently: We use the totality of our mind to gain the full perspective, and then we act with a singular clarity of purpose. Inside each tefillin box are parchments containing four Torah sections, which speak about God’s unity, the obligation to observe the commandments, and the responsibility to transmit Judaism to our descendants. If you’re really feeling generous, Tefillin is a wonderful gift for a Bar Mitzvah boy. Owning a pair of Tefillin (and wearing them!) is an important part of Jewish identity. But since they are expensive (about $400), not every Bar Mitzvah boy has a pair. To make sure you get kosher Tefillin, see here or here. Now here’s a Jewish trivia question: Who was the first person to have a Bar Mitzvah? 2) Isaac was the first person who was “Jewish” upon reaching age 13. The Torah writes, “And Abraham made a great party on the day” (Genesis 21:8), which the Midrash explains was a celebration for Isaac becoming Bar Mitzvah. 3) Mount Sinai – Only when the Torah was given at Mount Sinai did Jews became truly obligated to observe the mitzvot. Therefore, the Sinai experience was actually a mass Bar/Bat Mitzvah of the entire Jewish people. Some have the misconception that Jewish practice is confined to the synagogue, or to an occasional holiday celebration at home. The truth is that Torah and mitzvot punctuate every moment of our lives: setting standards for business ethics, proper speech, honoring parents, what we eat, and even how to care for pets! We refer to these laws as Torat Chaim, literally “instructions for living.” Torah is the ultimate “owner’s manual” for maximizing our pleasure and potential in life. Torah is a basis for life’s most important questions: How can I live a meaningful life? How can I build successful relationships, deal honestly in business, and fulfill my personal potential? How can I really make a difference in the world? Torah study emphasizes building a rational basis of belief, to engage one’s mind, stimulate the intellect through questioning and debate, and thereby nourish the soul. It does not endorse a leap of faith, all-or-nothing decisions, or disengagement from the world. The goal of any Jew is not only to study the Torah, but to become a “living Torah,” who embodies the lofty ideals of “love your neighbor,” “peace on earth,” “justice for all,” “universal education,” “all men are created equal,” “dignity of the individual,” and “the preciousness of life.” These concepts all originate from the Torah, and these have defined the moral makeup of humanity. In Jewish life, a Bar/Bat Mitzvah does not represent the culmination of one’s Jewish education, but rather a stepping-stone to a more mature and profound relationship with Jewish learning. This is illustrated by the following idea: If even one letter is missing from a Torah scroll, it is rendered invalid. According to tradition, each Jew corresponds to one letter in the Torah. This teaches that each and every one of us has an integral role to play in the future of the Jewish people. Bar/Bat Mitzvah means to become educated, and to strengthen one’s Jewish pride through knowledge and understanding. It means to grow Jewishly, one step at a time. It means standing up for Israel and respecting every Jew. It means taking responsibility for the world, using the Torah as our guide, because that is the mission of the Jewish people. And most of all, it means to love being Jewish. Success in achieving these goals is what we wish for the Bar/Bat Mitzvah, and the beginning of that journey is what we celebrate on this joyous occasion. Rabbi Shraga Simmons grew up trekking through snow in Buffalo, New York, enjoying summers as a tour guide at Niagara Falls. He holds a degree in journalism from the University of Texas at Austin, and rabbinic ordination from the Chief Rabbi of Jerusalem. He is the co-founder of Aish.com, and founder of the Torah study site, JewishPathways.com. He is also the co-founder of HonestReporting.com, and author of “David & Goliath”, the definitive treatment of media bias against Israel (2012). He lives with his wife and children in the Modi’in region of Israel. Do you feel like your diet is missing something? Have you been trying to lose weight, improve your digestion, or just feel better overall? As someone who struggled with her weight for years before finally finding weight loss methods that work, I want to share with you one of my favorite fruits. The pomegranate has helped immensely in my weight loss and health improvement journey. There are a wide variety of positives associated with consumption of pomegranate fruit, juice and seeds. I’ve investigated six health benefits of pomegranate below. Pomegranate aids in weight loss for many reasons (source). First and perhaps most important – pomegranate seeds are low in calories. One serving (about 3/4 cup) of seeds has only 83 calories, making them the perfect snack for people who are watching their weight. Pomegranate seeds are also high in fiber, with one serving boasting 4 grams. Fiber is important for everyone, but especially those focused on weight loss because it will help you feel full longer. This means you will be less likely to overeat. Pomegranate juice can decrease a man’s risk of impotency by helping manage arteriosclerosis. Arteriosclerosis is a condition in which blood vessels become blocked, causing many serious health effects including impotence. It is the high level of antioxidants found in pomegranates that helps with arteriosclerosis. Pomegranates and pomegranate juice can also help treat and prevent prostate cancer. In trials, it has been found that pomegranate juice, because of its high phytochemical content, helps to inhibit the growth of cancer cells and prevent it from metastasizing (source). The pomegranate doesn’t discriminate – it just helps men and women in different ways! Pomegranate juice is very good for pregnant women. It contains important vitamins that expectant mothers need, including niacin, folic acid, potassium, calcium, and vitamin C, as well as iron and fiber (source). Pomegranate juice can also help pregnant women by reducing cramps and sleep difficulty. It also helps the baby by increasing blood flow, decreasing his or her risk for brain damage. For women, pomegranate juice prevents estrogen-responsive breast cancer cells from growing. The juice has a phytochemical inhibits aromatase, which is used to create estrogen, which in excess increases your risk of having breast cancer. Pomegranate protects the epidermis (outer layer of the skin) and dermis (second layer of the skin) by encouraging skin cell regeneration. This aids in the repair of tissues, promotes healing wounds, and encourages circulation to the skin. Consuming pomegranate gives the skin compounds that help protect against free radicas, which in excess, can cause sun damage, cancer and sunburn. The oil from a pomegranate contains the antioxidant ellagic acid which helps inhibit skin tumors, protecting the body from skin cancer. Pomegranates slow down the appearance of aging. They help prevent common signs including hyperpigmentation, age spots, fine lines, and wrinkles. Pomegranate also softens the skin and produces elastin and collagen, creating a more youthful appearance. Your skin will be firmer, smoother, and more youthful. Pomegranate will help you put your best face forward. If your skin is dry, pomegranates can help, which is why their extract is often added to skin care products. Their molecular structure can penetrate deep into most skin types to add extra moisture. If your skin is oily or combination, pomegranate can sooth acne breakouts while minimizing the scarring that can occur after a breakout. Pomegranates don’t just provide vitamins for pregnant women. Everybody needs vitamins C and K, and pomegranates provide 17 percent of the recommended daily value of vitamin C and 20 percent of the recommended daily value of vitamin K (source). Vitamin C is important for a healthy, functioning immune system, as well as fast wound healing, healthy gums, and the manufacture of collagen and elastin. It also enhances iron absorption. Vitamin K is crucial for strong, healthy bones and proper blood clotting. For men and women who are trying to lose weight, it is especially important to make sure you are keeping your cholesterol and blood pressure in check. Pomegranate lowers LDL (bad cholesterol) and raises HDL (good cholesterol) (source). Many overweight men and women also suffer from hypertension (high blood pressure) which can lead to a variety of problems, including heart disease, heart attacks, aneurysms, and kidney failure (source). Drinking just 1.7 ounces of pomegranate juice per day can lower blood pressure by as much as 5 percent. Pomegranate can also decrease the risk for osteoarthritis by preventing cartilage deterioration, and it prevents plaque from building up in the arteries, which can lead to heart disease and high blood pressure. Get yourself a fresh pomegranate or some pomegranate juice from the grocery store today, and start consuming it regularly. You’ll be amazed at how quickly you start to notice improvements in your weight loss and improved health endeavors! Pedestrians who talk on the phone put themselves in danger, but the risk is even greater when it comes to children. Now that the summer holiday is over, millions of kids are roaming the streets while talking or texting on their mobile devices. A study conducted by researchers from Israel’s Ben-Gurion University unequivocally shows how a child pedestrian’s ability to safely cross the road is hindered more during a cell phone conversation than an adult’s. Pedestrians are also required to complete several cognitive tasks, such as: estimate the speed and distance of traveling vehicles and assess their arrival. Thus, “visual, auditory or cognitive based distractions, which may draw attention from the crossing task, can cause pedestrians to miss critical information from the environment, and as a consequence, make wrong assessments and be exposed to higher risk of collision,” according to the study. Furthermore, US statistics show that 20 percent of the third-graders (aged 8–9) own cell phones, 40 percent of fifth-graders (aged 10–11) do, and 83 percent of middle school students (aged 11–14) carry mobile devices. “Although many children carry cell phones, the effect that cell phone conversations have on children’s crossing behavior has not been thoroughly examined,” BGU‘s Prof. Tal Oron-Gilad said in a statement. According to the researcher, one-third of the road traffic fatalities in low- and middle-income countries are among pedestrians. “This high level of involvement is particularly meaningful for child pedestrians as the proportion of child pedestrian fatalities is significantly high relative to adults,” she adds. The study, which was published recently in Safety Science, was conducted at the BGU Virtual Environment Simulation Laboratory, one of the world’s most sophisticated traffic research facilities, which enables researchers to measure pedestrian reactions to virtual reality scenarios. BGU’s pedestrian dome simulator consists of a 180-degree spherical screen aligned with an accurate three-projector system large enough to immerse a participant within its circumference, according to the university. The simulator experiment was conducted in a virtual city environment with 14 adults and 38 children who experienced street-crossing scenarios paired with pre-determined cell phone conversations. The subjects were requested to press a response button whenever they felt it was safe to cross, while the researchers tracked their eye movements. In addition, the researchers found that the ability to make better crossing decisions improved with age. The most prominent improvement was shown in the “safety gap” – each age group maintained a longer gap than the younger one preceding it.